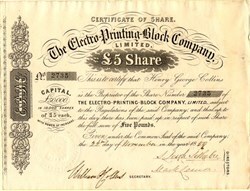 Beautiful certificate from the Electro-Printing-Block Company, Limited issued in 1859. This historic document was printed by C. & A. Doubble Company. This item has the signatures of the Company's Director's and is over 149 years old. Etectro-printing was the processes of the Electro-Printing-Block Company (patented by Mr. H. G. Collins) supply the means of reproducing drawings, engravings, without the aid of copyist or engraver, not only of the same size as the original, but enlarged or reduced with strict accuracy to any extent that may be desired. Thus, from a woodcut or steel engraving a working plate or block can be produced that will yield impressions of any other required proportion.